This post reflects the work of a large group of Google engineers, research scientists, and others including: Ari Gilder, Aseem Agarwala, Brendan Jou, Chris Breithaupt, David Karam, Eric Penner, Farooq Ahmad, Henri Astre, Hillary Strickland, John Zhang, Marius Renn, Matt Bridges, Maxwell Collins, Navid Shiee, Ryan Gordon, Sarah Clinckemaillie, Shu Zhang, Vivek Kesarwani, Xuhui Jia, Yukun Zhu and Yuzo Watanabe. Another broad mission of Google’s research group in Princeton is to develop principled building ￼blocks for decision-making systems. In particular, the group strives to leverage provable guarantees from the field of online learning, which studies the robust (worst-case) guarantees of decision-making algorithms under uncertainty. An online algorithm is said to attain a no-regret guarantee if it learns to make decisions as well as the best "offline" decision in hindsight. 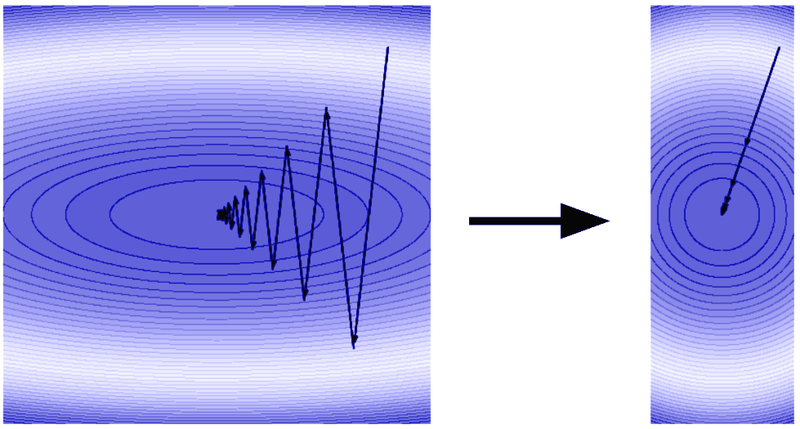 Ideas from this field have already enabled many innovations within theoretical computer science, and provide a mathematically elegant framework to study a widely-used technique called boosting. We envision using ideas from online learning to broaden the toolkit of modern reinforcement learning. 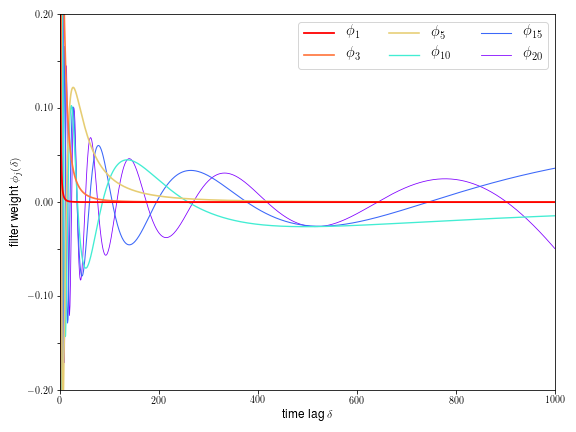 With that goal in mind, and in collaboration with researchers and students at Princeton, we developed the algorithmic technique of spectral filtering for estimation and control of linear dynamical systems (see several recent publications). In this setting, noisy observations (e.g., location sensor measurements) are being streamed from an unknown source. 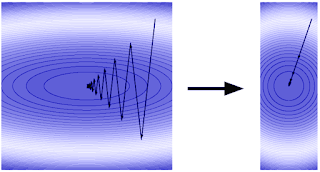 The source of the signal is a system whose state evolves over time following a set of linear equations (e.g. Newton's laws). To forecast future signals (prediction), or to perform actions which bring the system to a desired state (control), the usual approach starts with learning the model explicitly (a task termed system identification), which is often slow and inaccurate. Two years ago, we announced our inaugural work in training deep learning models for diabetic retinopathy (DR), a complication of diabetes that is one of the fastest growing causes of vision loss. Based on this research, we set out to apply our technology to improve health outcomes in the world. At the same time, we’ve continued our efforts to improve the model’s performance, explainability, and applicability in clinical settings. Today, we are sharing our research progress toward these goals, as well as announcing a new partner in Thailand. In this particular case, our model also indicated evidence for no DR. 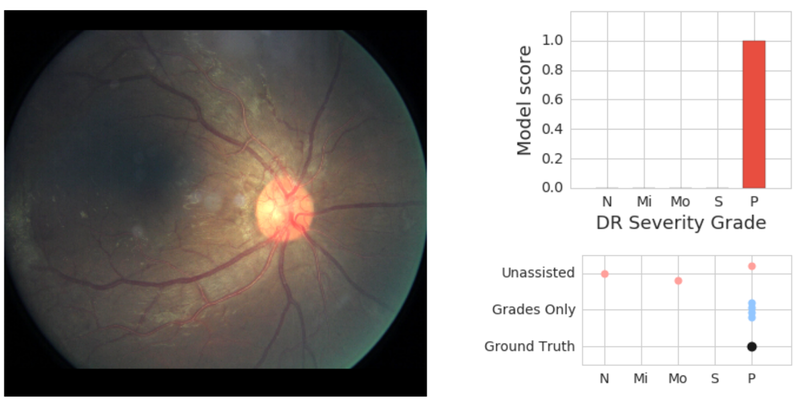 However, when ophthalmologists saw the model’s predictions, all three gave the correct answer. Seeing that the model saw some evidence for Moderate -- even if it wasn’t the highest score -- may prompt doctors to examine particular cases more carefully for pathology they may otherwise miss. We are excited to develop assistance that works like this, where human and machine learning abilities complement each other. From a remarkably young age, people are capable of recognizing their favorite objects and picking them up, despite never being explicitly taught how to do so. According to cognitive developmental research, the ability to interact with objects in the world plays a crucial role in the emergence of object perception and manipulation capabilities, such as targeted grasping. By interacting with the world around them, people are able to learn with self-supervision: we know what actions we took, and we learn from the outcome. In robotics, this type of self-supervised learning is actively researched because it enables robotic systems to learn without the need for large amounts of training data or manual supervision. Inspired by the concept of object permanence, we propose Grasp2Vec, a simple yet highly effective algorithm for acquiring object representations. Grasp2Vec is based on the intuition that an attempt to pick up anything provides several pieces of information — if a robot grasps an object and holds it up, the object had to be in the scene before the grasp. Furthermore, the robot knows that the object it grasped is currently in its gripper, and therefore has been removed from the scene. By using this form of self supervision, the robot can learn to recognize the object by the visual change in the scene after the grasp. Building on our prior collaboration with X Robotics, where a series of robots learn in parallel to grasp household objects using only monocular camera inputs, we use a robotic arm to grasp objects “unintentionally”, and that experience enables the learning of a rich representation of objects. These representations can then be used to acquire “intentional grasping” capabilities, where the robot arm can then pick up user-commanded objects. In the framework of reinforcement learning (RL), task success is measured via a “reward function”. By maximizing that reward, robots can teach themselves diverse grasping skills from scratch. 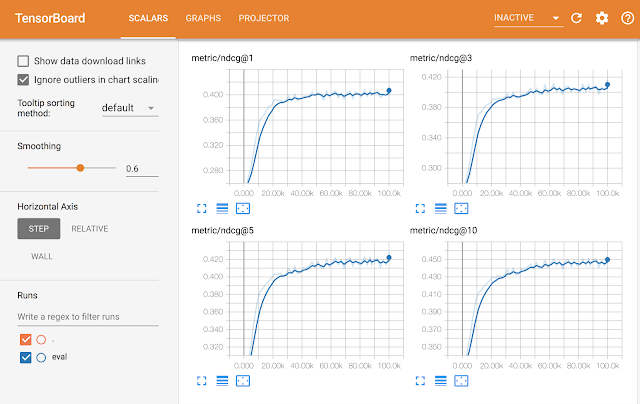 Engineering a reward function is easy when success can be measured by simple sensor measurements. A simple example of this is a button that supplies rewards directly to a robot when it is pushed. However, engineering a reward function is much more difficult when our success criteria depends on perceptual understanding of the task at hand. Consider the task of instance grasping, where a robot is presented a picture of a desired object being held in the gripper. After the robot attempts to grasp that object, it inspects the contents of the gripper. The reward function for this task comes down to answering the question of object recognition: Do these objects match? On the left, the gripper is holding the brush and there are some objects (yellow cup, blue plastic block) in the background. On the right, the gripper is holding the yellow cup and the brush is in the background. If the left image was the desired outcome, a good reward function should “understand” that the two images above correspond to different objects. In order to solve this recognition problem, we need a perception system that extracts meaningful object concepts from unstructured image data (without any human annotations), learning the visual perception of objects in an unsupervised fashion. At their core, unsupervised learning algorithms work because they make structural assumptions about data. It is common to assume that images can be compressed into a low-dimensional space, and that frames in a video can be predicted from previous frames. However, without further assumptions on the content of the data, these are usually insufficient for learning disentangled object representations. What if we used a robot to physically disentangle objects from each other during data collection? The field of robotics presents an exciting opportunity for representation learning because robots can manipulate objects, thus providing the factors of variation needed in data. Our method relies on the insight that grasping an object removes it from the scene. This yields 1) an image of the scene before grasping, 2) an image of the scene after grasping and 3) an isolated view of the grasped object itself. Left: Objects before the grasp. Center: Objects after the grasp. Right: The Grasped object. 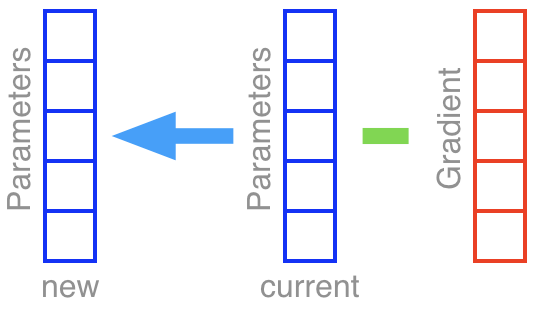 We implement this equality relation using a fully convolutional architecture and a simple metric learning algorithm. 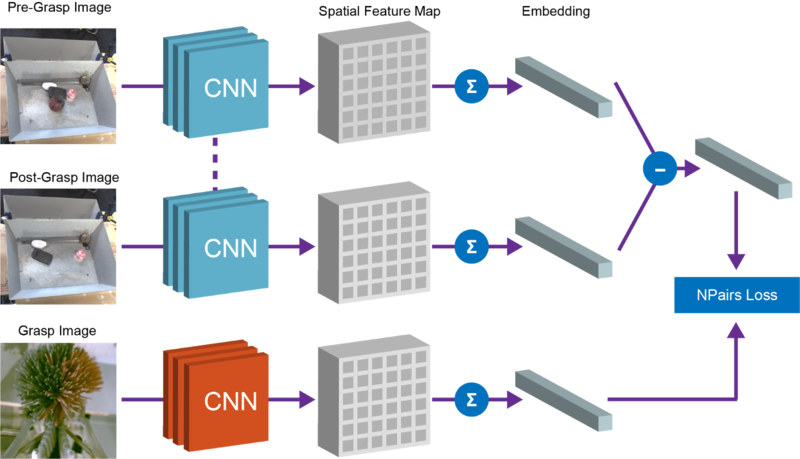 At training time, the architecture shown below embeds the pre-grasp images and post-grasp images into a dense spatial feature map. The maps are mean-pooled into vectors and the difference between the “before grasp” and “after grasp” vectors represents a set of objects. 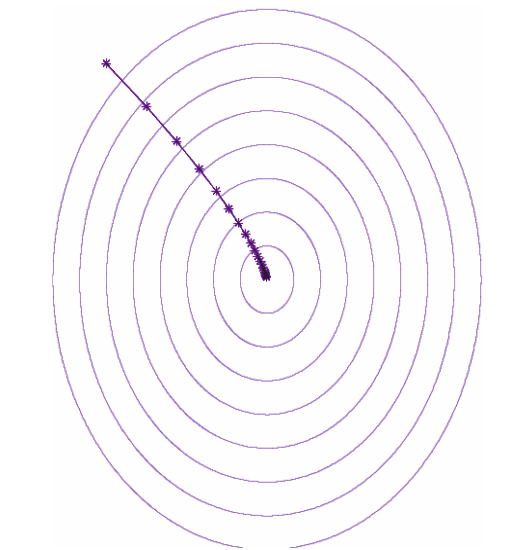 This vector and the corresponding vector representation of the grasped object are pushed to equivalence via the N-Pairs objective. Once trained, two useful properties emerge naturally from our model. The first property is that a cosine distance between vector embeddings allows us to compare objects and determine whether they are identical. This can be used to implement reward functions for reinforcement learning, and allow robots to learn instance grasping without human-provided labels. The second property is that we can combine scene spatial maps and object embeddings to localize a “query object” in image space. By taking the element-wise product of spatial feature maps and the vector corresponding to the query object, we can find all the pixels in the spatial map that “match” the query object. Using Grasp2Vec embeddings to localize objects in a scene. The image on the top left shows the objects in the bin. On the bottom left is the query object we wish to grasp. By taking the dot product of the query object vector with the spatial features of the scene image, we get a per-pixel “activation map” (top right image) of how similar that region of the image is to the query. This response map can be used to approach the object for grasping. Our method also works when there are multiple objects that match the query object, or even if the query consists of multiple objects (the average of two vectors). For example, here is a scenario where it detects multiple orange blocks in a scene. The resulting “heatmap” can be used to plan the robot approach to the target object(s). 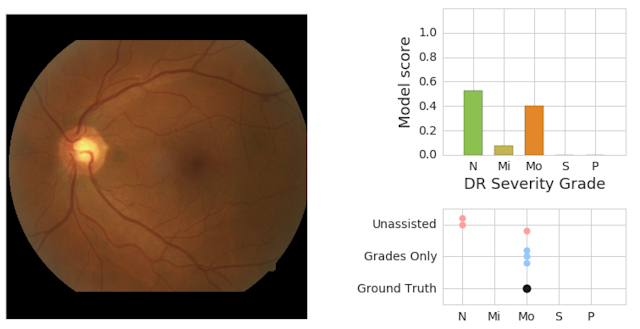 We combine Grasp2Vec’s localization and instance recognition capabilities with our “grasp anything” policies to obtain a success rate of 80% on objects seen during data collection and 59% on novel objects the robot hasn’t encountered before. In our paper, we show how robotic grasping skills can generate the data used for learning object-centric representations. We then can use representation learning to “bootstrap” more complex skills like instance grasping, all while retaining the self-supervised learning properties of our autonomous grasping system. Besides our own work, a number of recent papers have also studied how self-supervised interaction can be used to acquire representations, by grasping, pushing, and otherwise manipulating objects in the environment. Going forward, we are excited not only for what machine learning can bring to robotics by way of better perception and control, but also what robotics can bring to machine learning in new paradigms of self-supervision. This research was conducted by Eric Jang, Coline Devin, Vincent Vanhoucke, and Sergey Levine. We’d like to thank Adrian Li, Alex Irpan, Anthony Brohan, Chelsea Finn, Christian Howard, Corey Lynch, Dmitry Kalashnikov, Ian Wilkes, Ivonne Fajardo, Julian Ibarz, Ming Zhao, Peter Pastor, Pierre Sermanet, Stephen James, Tsung-Yi Lin, Yunfei Bai, and many others at Google, X, and the broader robotics community who contributed to improving this work. Over the past few years, Google Translate has made significant improvements to translation quality by switching to an end-to-end neural network-based system. At the same time, we realized that translations from our models can reflect societal biases, such as gender bias. Specifically, languages differ a lot in how they represent gender, and when there are ambiguities during translation, the systems tend to pick gender choices that reflect societal asymmetries, resulting in biased translations. For instance, Google Translate historically translated the Turkish equivalent of “He/she is a doctor” into the masculine form, and the Turkish equivalent of “He/she is a nurse” into the feminine form. Recently, we announced that we’re taking the first step at reducing gender bias in our translations. We now provide both feminine and masculine translations when translating single-word queries from English to four different languages (French, Italian, Portuguese, and Spanish), and when translating phrases and sentences from Turkish to English. Supporting gender-specific translations for single-word queries involved enriching our underlying dictionary with gender attributes. Supporting gender-specific translations for longer queries (phrases and sentences) was particularly challenging and involved making significant changes to our translation framework. For these longer queries, we focused initially on Turkish-to-English translation. 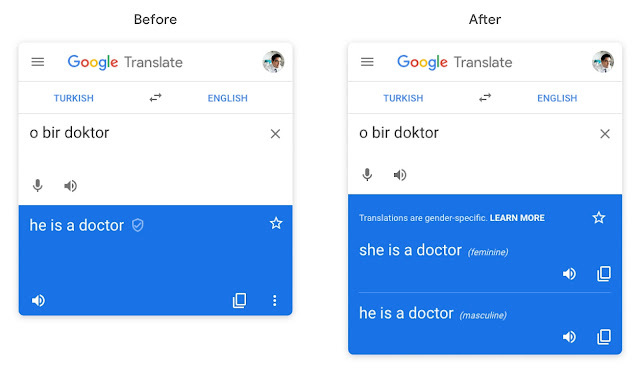 We developed a three-step approach to solve the problem of providing a masculine and feminine translation in English for a gender-neutral query in Turkish. Many Turkish sentences that refer to people are gender-neutral, but not all are. Detecting which queries are eligible for gender-specific translations is a hard problem because Turkish is morphologically complex, meaning that reference to a person can either be explicit with a gender-neutral pronoun (e.g. O, Ona) or implicitly encoded. For example, the sentence “Biliyor mu?” has no explicit gender-neutral pronoun but can be translated as either “Does she know?” or “Does he know?”. This complexity means that we cannot use a simple list of gender-neutral pronouns to detect gender-neutral Turkish queries and need a machine-learned system. We estimate that approximately 10% of Turkish Translate queries are ambiguous, and eligible for both feminine and masculine translations. To detect these queries, we use state-of-the-art text classification algorithms (same as those used in our Cloud Natural Language API) to build a system that is able to detect when a given Turkish query is gender-neutral. Since this introduces an additional step before obtaining the translations, we had to carefully balance model complexity with latency. We trained our system on thousands of human-rated Turkish examples, where raters were asked to judge whether a given example is gender-neutral or not. Our final classification system is a convolutional neural network that can accurately detect queries which require gender-specific translations. Identifying and dividing our parallel training data into those with feminine words, those with masculine and those with ungendered words. Training our enhanced NMT model on the feminine, masculine and ungendered data sources. We experimented with various mixing ratios for these sources to enable the model to perform equally well on the three tasks. If a user's query is determined to be gender-neutral, we add a gender prefix to the translation request. For these requests, our final NMT model can reliably produce feminine and masculine translations 99% of the time. Additionally, the system maintains translation quality on queries without the gender prefix. If the requested feminine translation is feminine. If the requested masculine translation is masculine. If the feminine and masculine translations are exactly equivalent with the exception of gender-related changes. Even minor changes in the wording between the translations will result in being filtered. Top: The masculine and feminine translations differ only with respect to gender i.e. “he” and “his” vs “she” and “her”. Hence, we will show gender-specific translations. Bottom: The masculine and feminine translations differ correctly with respect to gender i.e. “he” vs “she”. However, the change from “really” to “actually” is not related to gender. Hence, we will filter gender-specific translations and display the default translation. Putting it all together, input sentences first go through the classifier, which detects whether they’re eligible for gender-specific translations. If the classifier says “yes”, we send three requests to our enhanced NMT model—a feminine request, a masculine request and an ungendered request. Our final step takes into account all three responses and decides whether to display gender-specific translations or a single default translation. This step is still quite conservative in order to maximize the quality of gender-specific translations shown; hence our overall recall is only around 60%. We plan to increase our coverage and add support for more complex sentences in future iterations. This is just the first step toward addressing gender bias in machine-translation systems and reiterates Google’s commitment to fairness in machine learning. In the future, we plan to extend gender-specific translations to more languages and to address non-binary gender in translations. This effort has been successful thanks to the hard work of a lot of people including, but not limited to, the following (in alphabetical order of last name): Lindsey Boran, HyunJeong Choe, Héctor Fernández Alcalde, Orhan Firat, Qin Gao, Rick Genter, Macduff Hughes, Tolga Kayadelen, James Kuczmarski, Tatiana Lando, Liu Liu, Michael Mandl, Nihal Meriç Atilla, Mengmeng Niu, Adnan Ozturel, Emily Pitler, Kathy Ray, John Richardson, Larissa Rinaldi, Alex Rudnick, Apu Shah, Jason Smith, Antonio Stella, Romina Stella, Jana Strnadova, Katrin Tomanek, Barak Turovsky, Dan Schwarz, Shilp Vaishnav, Clayton Watts, Kellie Webster, Colin Young, Pendar Yousefi, Candice Zhang and Min Zhao. Progress in machine learning (ML) is happening so rapidly, that it can sometimes feel like any idea or algorithm more than 2 years old is already outdated or superseded by something better. However, old ideas sometimes remain relevant even when a large fraction of the scientific community has turned away from them. This is often a question of context: an idea which may seem to be a dead end in a particular context may become wildly successful in a different one. In the specific case of deep learning (DL), the growth of both the availability of data and computing power renewed interest in the area and significantly influenced research directions. The NIPS 2007 paper “The Trade-Offs of Large Scale Learning” by Léon Bottou (then at NEC Labs, now at Facebook AI Research) and Olivier Bousquet (Google AI, Zürich) is a good example of this phenomenon. As the recent recipient of the NeurIPS 2018 Test of Time Award, this seminal work investigated the interplay between data and computation in ML, showing that if one is limited by computing power but can make use of a large dataset, it is more efficient to perform a small amount of computation on many individual training examples rather than to perform extensive computation on a subset of the data. This demonstrated the power of an old algorithm, stochastic gradient descent, which is nowadays used in pretty much all applications of DL. 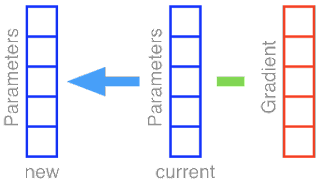 A model, which is a set of possible functions that will be used to fit the data. An optimization algorithm which specifies how to find the best function in that set. Back in the 90’s the datasets used in ML were much smaller than the ones in use today, and while artificial neural networks had already led to some successes, they were considered hard to train. In the early 2000’s, with the introduction of Kernel Machines (SVMs in particular), neural networks went out of fashion. Simultaneously, the attention shifted away from the optimization algorithms that had been used to train neural networks (stochastic gradient descent) to focus on those used for kernel machines (quadratic programming). One important difference being that in the former case, training examples are used one at a time to perform gradient steps (this is called “stochastic”), while in the latter case, all training examples are used at each iteration (this is called “batch”). As the size of the training sets increased, the efficiency of optimization algorithms to handle large amounts of data became a bottleneck. For example, in the case of quadratic programming, running time scales at least quadratically in the number of examples. In other words, if you double your training set size, your training will take at least 4 times longer. Hence, lots of effort went into trying to make these algorithms scale to larger training sets (see for example Large Scale Kernel Machines). 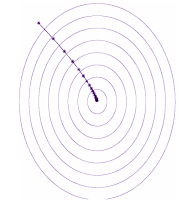 People who had experience with training neural networks knew that stochastic gradient descent was comparably easier to scale to large datasets, but unfortunately its convergence is very slow (it takes lots of iterations to reach an accuracy comparable to that of a batch algorithm), so it wasn’t clear that this would be a solution to the scaling problem. In the context of ML, the number of iterations needed to optimize the cost function is actually not the main concern: there is no point in perfectly tuning your model since you will essentially “overfit” to the training data. So why not reduce the computational effort that you put into tuning the model and instead spend the effort processing more data? The work of Léon and Olivier provided a formal study of this phenomenon: by considering access to a large amount of data and assuming the limiting factor is computation, they showed that it is better to perform a minimal amount of computation on each individual training example (thus processing more of them) rather than performing extensive computation on a smaller amount of data. In doing so, they also demonstrated that among various possible optimization algorithms, stochastic gradient descent is the best. This was confirmed by many experiments and led to a renewed interest in online optimization algorithms which are now in extensive use in ML. In the following years, many variants of stochastic gradient descent were developed both in the convex case and in the non-convex one (particularly relevant for DL). 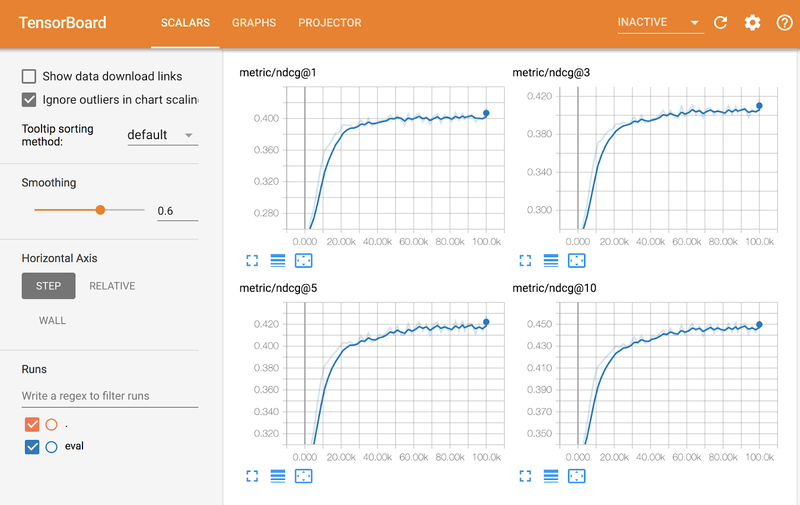 The most common variant now is the so-called “mini-batch” SGD where one considers a small number (~10-100) of training examples at each iteration, and performs several passes over the training set, with a couple of clever tricks to scale the gradient appropriately. Most ML libraries provide a default implementation of such an algorithm and it is arguably one of the pillars of DL. While this analysis provided a solid foundation for understanding the properties of this algorithm, the amazing and sometimes surprising successes of DL continue to raise many more questions for the scientific community. 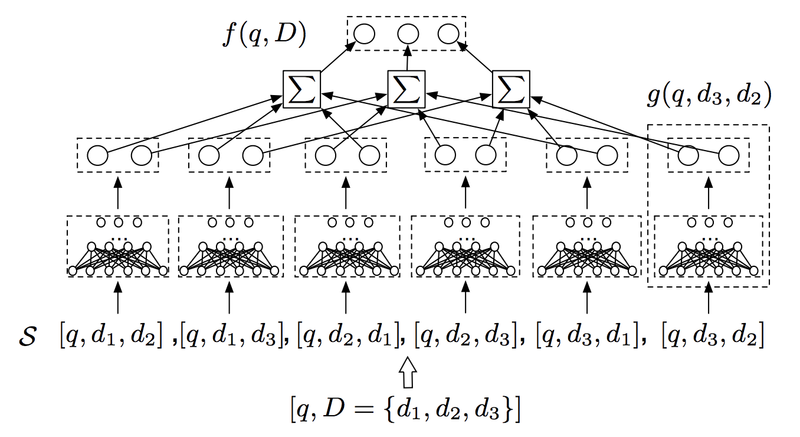 In particular, the role of this algorithm in the generalization properties of deep networks has been repeatedly demonstrated but is still poorly understood. This means that a lot of fascinating questions are yet to be explored which could lead to a better understanding of the algorithms currently in use and the development of even more efficient algorithms in the future. The perspective proposed by Léon and Olivier in their collaboration 10 years ago provided a significant boost to the development of the algorithm that is nowadays the workhorse of ML systems that benefit our lives daily, and we offer our sincere congratulations to both authors on this well-deserved award.